Hyderabad- is a place of royalty with many Forts, Masjids, Palaces, Museums & Planetarium, Parks& Gardens and Beautiful Lakes. As a part of India, it is filled with the touch of tradition and culture. And, to visit such a place, all you need to do is contact HOTEL SHRI SAI MURLI. 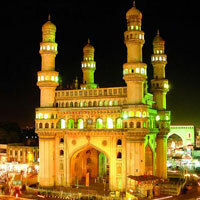 It is also a Tour & Travel Operator offering you Hyderabad Tour Packages, which includes booking for travel, accommodation and dinning. We have a team of professionals that is knowledgeable and aware with the specialty of the place and thus can provide you with a flexible tour-itinerary in compliance with your comfort.